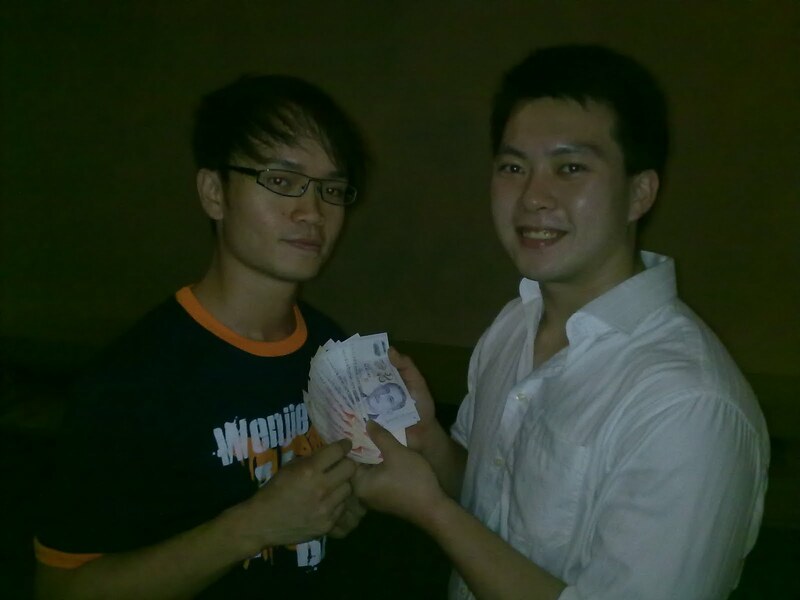 Wenjie won himself a prize of $88. for winning VoM CNY special. Stay tuned for even more specials coming up. The winner for BPoM February is by Chew Long from Alpha Verve. She won herself $138; this is the largest ever payout to 1 single winner. We have the 2nd video entry for March VoM by Li Jing from Alpha Verve. Simply an amazing video done, I really loved the effects used (teach me one day ok? haha). The video showed the "sunshine after the rain". The beginning of the video was in black and white (rain), showing all the failed attempts; and then transited to colour (sunshine) showcasing all the glory of Alpha Verve. Alpha had come a long way this season, and I had seen all of you grow together with the team, become stronger, better and most importantly more united even through adversity and hardships. Jiayou Alphas! P.S: The title says episode 1 so there will be an episode 2 coming soon? 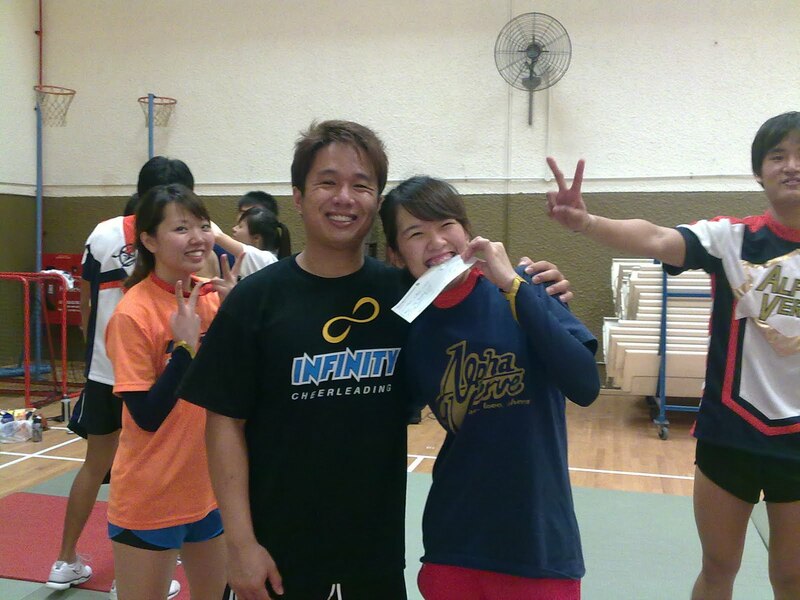 The 2nd BPoM October by Stanley from Team Seven of NTU Hall 7. Stanley talks about his 4 years of cheerleading in NTU HO with Hall 7. For each year, Stanley noticed the rise in standards, hitting higher level stunts. However Stanley feels that the ever rising standards is also a double edged sword, with the greater possibility and risk of getting injured. It was highlighted in the post his opinion of the difference between "theme cheerleading" and "cheerleading cheerleading"; their pros and cons and how each affects the safety of the competition in general. 1) Trust - without the trust of every individuals, we will not be able to hit high level stunts.I personally will like to praise the flyers and mid-tiers for all the trust they had given to the bases and believing that we will catch them no matter what happen. 2) Determination - It has not been a smooth ride to the competition from the starts and we certainly encountered alot of obstacles along the way, i.e stunts failed, injuries, personal commitment, but the team had shown great determination in overcome the challenges and obstacles. 3) Courage & Bravery - The flyers shows tremendous courage in their willingness to try difficult stunts despite being in mid-air and also the bases which shows tremendous bravery in catching the flyers no matter how they dismount from the stunts. 4) Belief - To have the belief that you can achieved when all odds are against you. To believe in the coaches, seniors, juniors and everyone around you. Tell yourself, you can do it. Do it with no regrets. I have to agree totally with Stanley about what cheerleading can bring to a person in terms of character building. At every phrase of cheerleading, we always learnt something new, or discover something about ourselves we did not noticed before. I believe cheerleading as a whole in SG is very young, and even younger in NTU context, therefore there are still many things to learn, by the committee, the players, the coaches, the judges and everyone involved. Let's take every year as a stepping stone and build towards a brighter future for cheerleading together. The 1st entry for March VoM is by Kerry of Astros. The video is the performance by Astros at Shingda CNY celebration dinner. This is also the first time all 12 members of Astros are performing together on stage in the new uniforms. Good job Astros, wishing Astros a prosperous new year. I really hate to be posting up the entries so late these days. Arghh! Anyway the 1st entry of BPOM March is a little special; a post on Spectrum blog by Ah Fu (I assume is the Captain CF?) but the post is a message by their coach Vincent. And then BPoM entry is made by Vincent himself by tagging me. I guess should be Vincent asked it to be posted on Spectrum's blog on his behalf. So if the entry wins, you all go sort out the prize yourselves k. haha. Ok the post a "Message from Vincent" is a message from Vincent (duh obviously, haha), also the coach of Team Spectrum; a sort of wrap up message to them just before their HO performance. A very heart warming and inspirational speech by Vincent. I believe that it is every coaches role, not only train the skills required for the routine, but also to motivate and encourage, to bring the members morale up. Vincent has indeed done a fantastic job as Spectrum's coach. Wenjie for his video on NTU Hall 16 Team Xtreme. 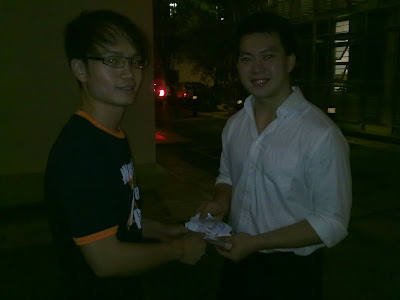 Wenjie will be walking away with a prize of $88. A video showing Team Xtreme in action, some of the stunts that they done for NTU HO 2011. I really love such videos, showing the confidence the team has right before the competition. Cheerleading is never only about the results. The process is always more important and forms the biggest part of your memories and builds the strongest bonds between team mates. Congratulations to Wenjie once again for doing up a wonderful video for Team Xtreme. P.S: Hope to see some really interesting videos for March VoM. The post by Chew Long on "Keep holding on.. (:". Congratulations Chew Long, you have won yourself the total prize of $138. Chew Long has touched on many important points of the true meaning of being a cheerleader. Learning how to CONTROL, CONFRONT and CONQUER your fears, trusting and appreciating your team mates and most importantly, daring to live and hold on to what you truly believe in. A round of applause for all who contributed. In view that NTU HO Cheerleading Competition 2011 had just ended, we would like to encourage you to write a post on it, it can be about the trainings, the rising standards, the safety aspect, or any views and comments that can be shared with everyone. Special prize will be given if an entry on NTU HO 2011 wins March BPoM. P.S: Tomorrow we will announce VoM and BPoM February, CNY special. The 1st entry for February VoM is by Wenjie from NTU Hall 16 Team Xtreme. I would not say that the video is about the trainings they had for HO 2011, but I would say it is more like a little teaser of the show Team Xtreme is going to put up for NTU HO next week. It is a very very well edited video, using lots of nice and cool effects. All the best for the performance. P.S: Everyone jiayou for HO!! The 4th entry of BPOM February is by Chew Long from Alpha Verve, for her post on Alpha Verve Blog, "Keep holding on.. (:". This is the first time Chew Long is taking part in BPoM and she started it off with a very well written post, full of many of her self experiences and motivation to team mates. The post may be written for her teammates, but there are many lessons to be taken away by everyone too. P.S: Jiayou for Nationals everyone.